Oxford philosopher/historian Berlin's strangest book, one that he set aside 25 years ago and had no wish to return to until editor Hardy intervened. Nor is this labeled as part of his "history of ideas" series (Against the Current, 1982; The Crooked Timber of Humanity, 1991; etc.). Hardy encountered a collection of draft material dating from the 1960s that Berlin had written about J.G. Hamann (1730-88), beloved by Kant and Goethe, and decided to collate it, along with missing passages later found on dictabelts. 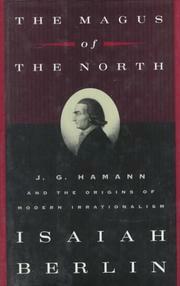 Berlin makes clear from the beginning that he has little sympathy for Hamann, despite his importance as an enemy of the Enlightenment, leader in the romantic revolt against universalism and the scientific method, and spearhead of the rise of modern irrationalism. (The closest 20th-century equivalent would be D.H. Lawrence with his mysticism of the blood and hatred of all philosophers and artists who to his mind insulted the natural forces he worshipped.) Hamann was part of the great tide of German mysticism erupting from Jacob Bohme. A trauma in his young manhood led Hamann to reread the Bible entire, and he arose from this experience seeing God everywhere, in everything, and regarding human beings' hunger for classification and order as a terrible distortion of the divine spirit. Berlin describes him as the only "wholly original critic of modern times," but points out his spiritual shortcomings and intense stupidity, which somehow contributed to his genius. Critical yet fair scrutiny gives new life to an attractive, even Blakean figure who anticipated the Industrial Revolution's dark satanic mills.